LIPO’s Acting officer in Charge Prince Decker, speaking the seminar , held yesterday at YMCA. 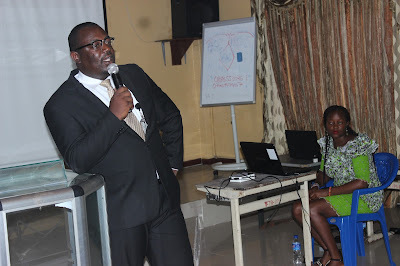 The Liberia Intellectual Property Office (LIPO) has for the first time since its inception hold a special seminar for artists and inventors, which is meant to enlighten them on the legal framework of intellectual property and the essence of its moral and economic rights. The special seminar, dubbed “Intellectual Property (IP) Clinic,” discusses the importance of IP, the value of it as an asset in commerce and economic development, and the present status of IP in Liberia. Among the participants were a large number of artists and inventors as well as users of IP. During the seminar, artists and inventors admitted that the low level of IP awareness among them makes it easier for their works to be exposed to infringement or piracy, because they are not registering their creations. LIPO’s Acting officer in Charge Prince Decker said the seminar comes at a time when the problem caused by lack of IP awareness among artists and inventors continue to have a disturbing financial effect on their trade; because they lack a basic understanding of the law, they don't register their works. Mr. Decker added that in order to stop these financial losses, the players in the industry need to firstly understand IP and its legal framework; and once they understand it they will start to reap the benefits. "If we are to build a society that will be knowledgeable about IP, it is essential that we reach out to the creators, to ensure that they are equipped with the IP knowledge needed to succeed in their field and avoid people exploiting them. “While it is the truth that IP has the potential to help reduce poverty, create employment and accelerate economic growth, this can only be done through comprehensive public awareness campaigns, to boost understanding of the system and its potential benefits, which we are doing now. “Educating the industry’s players about IP is crucial in harnessing the economic benefits of IP, which is vital to the longevity of creative industries; they will be their own security by suing people who pirate or infringe on their creations,” Mr. Decker said. Mr. Decker added that in a recent study by LIPO, it was discovered that 80% of creators know that IP is important, but doesn’t have the knowledge needed to support them in their future careers. So to give them this knowledge, LIPO decided to host the IP clinic and beef up the year-long nationwide campaign that it started. World IP Day is a day on which the global IP community joins with others to acknowledge the fundamentally important role of IP in promoting innovation and development throughout the world, the release said. DJ Weezy, CEO of Naymo Record, home of PCK and L’ Frankie, two of Liberia’s finest artists, in a statement said in today’s modern world, more young people are becoming inventors and artists, so they need to understand the country’s IP law and its legal framework, which is crucial to the creation of an enabling environment and a social knowledge about IP. Weezy added the IP clinic has educated him and members of the creative sector about the benefits of IP, as well as the do and do not, which they had no knowledge about. He noted that the continuation of this awareness is crucial in helping them to avoid the loss they incur on a daily basis. “You can believe that as CEO of a record label, which owns two of Liberia’s best artists, none of our songs are copyrighted because I never had the knowledge about this whole IP thing. “This lack of knowledge is affecting many of us, so we are kindly appealing for an extension. We need this kind of discussion frequently for the betterment of the industry. Today, we have learned a lot and now going home to apply it,” DJ Weezy added.